Making a good first impression is critical to attracting and gaining new customers. You’ve already spent money on marketing and advertising, whether it be online, print or radio and television, and have persuaded potential customers to call your business. Now it's up to you to give a positive impression through your voicemail greeting so you can convert those calls into sales. A professional voicemail greeting can be the difference between a happy and potentially-returning customer, to an unhappy one you will never hear from again. DO be warm and professional. No one wants to be greeted by a cold, indifferent and robotic voice. Having your messages produced by a recording studio will allow you to choose a voice that best suits your brand and that will deliver a warm, helpful and professional voice message greeting. On Air has a large bank of experienced and talented voices that can help you improve your customers experience. You can browse and listen to our voices here. You want your answering machine messages to be friendly and welcoming, but be careful not to get too informal. Your personal cell phone’s voicemail greeting might say, “It’s Frank - leave a message!” but that kind of casual greeting might turn off customers. When they call, they want to feel confident that they’ve contacted a professional and competent company that values their call. Be friendly, but not too nonchalant. DO inform the customer about the situation. The best voicemail greeting will be appreciative and informative. The initial message a customer hears should have your name and/or company’s name so they can be sure they’ve reached the right person. Give them lots of information including the reason you are not able to answer their call and when you will be checking messages. It’s important to let them know when they can expect to hear back from you and always apologize for missing their call. 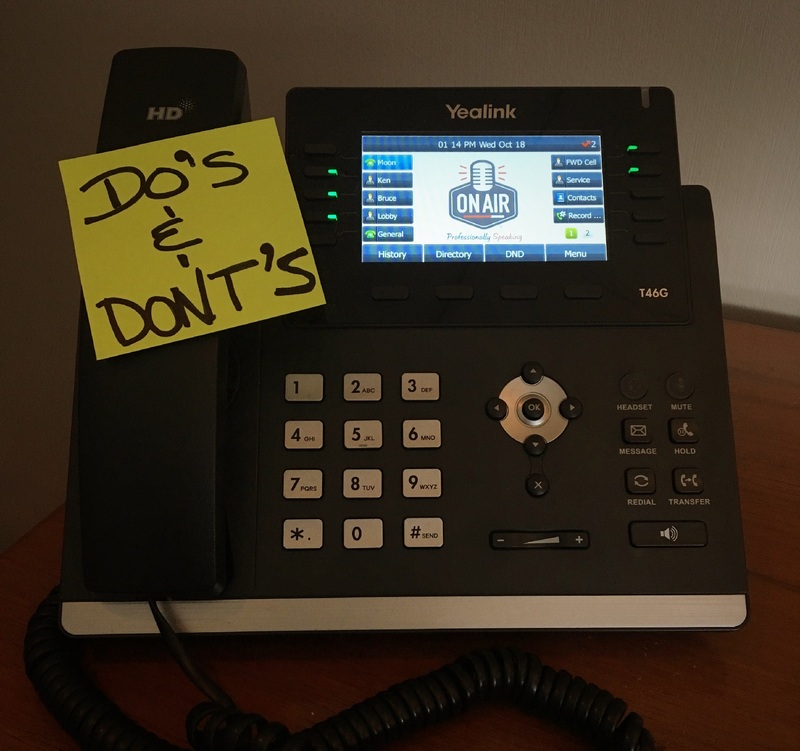 DON’T use your voicemail greeting as a long-winded sales pitch. Clear, concise and to-the-point messaging is the best way to go with your voice message greeting. Making your callers sits through a long message packed with your latest promotion and too much company information will try their patience. All they really want to do is leave a message so you can get back to them with the information they need. Instead, use that great sales and company information for your message on hold. Your voicemail greeting should be no longer than 30 seconds. DO consider producing professional voicemail greetings. When you have your voicemail greeting produced by a reputable recording studio, you can be sure your customers are getting the best first impression. On Air can write, voice and produce your greeting as well as your VOIP telephone system’s voice prompts and customized on hold messaging. Your messages will give your customers a warm welcome, clear instructions and a reason to call back. Have questions? Please don’t hesitate to contact us!